10th Pass + Must have passed the Government Technical Examination in Typewriting and Shorthand, (i)by the Higher Grade in Tamil and English, or, ii) by Higher Grade in Tamil and Lower Grade in English, or, iii)by Higher Grade in English and Lower Grade in Tamil, provided that candidates with the qualifications referred to in item (ii)above, shall be appointed only, if candidates with the qualifications referred to in item (i) above, are not available; Provided further that the qualifications referred to in item (iii) above, shall be appointed only if the candidates with the qualifications referred to in items (i) and (ii) above, are not available. A pass in Bachelor's degree in Computer Science / Computer Applications from a recognized University of Indian Union or a Bachelor's degree in B.A., or B.Sc., or B.Com., from a recognized University of Indian Union with a Diploma in Computer Applications from a recognized University. Technical Qualification: Typewriting Junior Grade (Tamil and English). 10th Pass + Must have passed the Government Technical Examination in Typewriting; (i)by the Higher Grade in Tamil and English, or, ii) by Higher Grade in Tamil and Lower Grade in English, or, iii)by Higher Grade in English and Lower Grade in Tamil, provided that candidates with the qualifications referred to in item (ii)above, shall be appointed only, if candidates with the qualifications referred to in item (i) above, are not available; Provided further that the qualifications referred to in item (iii) above, shall be appointed only if the candidates with the qualifications referred to in items (i) and (ii) above, are not available..
10th Std Passed with LMV Driving license must have the practical experience of 5 years. 10th Std Passed and having 6 month experience in operation of the Xerox Machine. Must be able to Read and Write in Tamil. Click the FACEBOOK ICON below To get Alerts of All Job Notifications from WAY2TNPSC Interested and Eligible Candidates can apply before 14-Jul-18. Keep on reading this page to know all the above details. So, it will be helpful to know the procedure and details for the candidates who wish to apply for this particular vacancies. 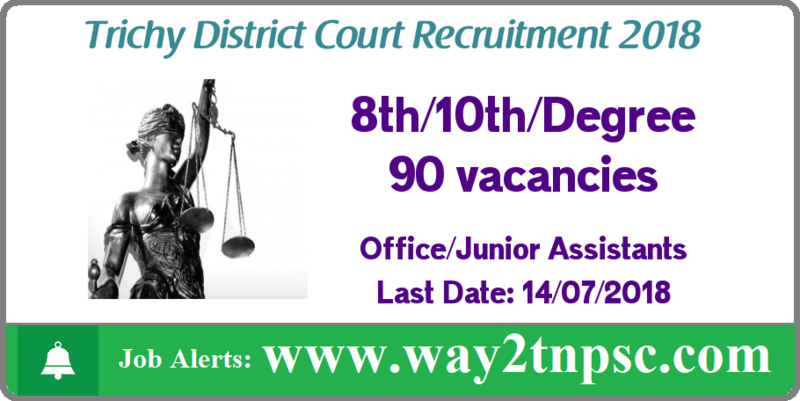 The above Notification ( Trichy Court Recruitment 2018 for 90 Office Assistants and Junior Assistants | Apply online ) briefly describes about the details of latest announcement or notification includes important dates like release date , last date of application submission, details regarding fees, exam timings. Candidates, check all the needs and apply accordingly.